Aphir’s debut release, Invirtue, opens with a looped vocal hook coupled with a sample of the static generated by a vinyl record stylus – the only non-human, non-sung element the listener hears until the E.P.’s closing track. It’s clear at the outset that the focus of these songs are the layers upon layers of rich, reverb-tinged vocals, and their lushly poetic lyrics. The tracks that comprise the E.P. are melancholy and haunting, wrapped as they are in a rich blanket of vocal-driven dream-pop haze. Aphir is a solo project by vocalist Becki Whitton. As lead singer of Canberra’s indie trio Cromwell, and also glitch-pop collaborative project Gunwaif, the prolific Whitton is no stranger to the microphone. But where in both of those ventures she has the backing of instrumentation, on this a cappella E.P., Whitton has bravely let her voice constitute almost the only instrument we hear. Opening track “Patience” turns the aforementioned vinyl sample into an extremely subtle, almost subliminal percussive element; the clicks and pops soon surrender the listener’s attention to Whitton’s otherworldly voice. Every syllable on the lead vocal is so precisely enunciated, every sibilant component performed with such clarity; it feels at times as if Whitton is sharing a physical space with the listener, confiding in them. Her clear vocals allow the lyrics on Invirtue to form a centrepiece around which Whitton’s voice can play – these words form an integral part of the whole. The tales are intensely personal affairs; songs of relationships, questions of faith, and how one can impact the other. Fertile ground for such a talented wordsmith. Lead single “Temperance” (for which a powerfully textural video was made with the help of, amongst others, Gunwaif collaborator Oscar Condon) is particularly affecting – “I pawed through your memories with clumsy hands / Saw you kneel before nails and dance upon pins / How fragile belief / But much more so affection / I left you with less than a word”. E.P. highlight “Long Shadow” is playfully soulful. The sombreness remains, but is tempered by the song’s backing vocals. On this track, they form less an accompaniment to the lead and act almost like a synthesiser arpeggiator; complex, mesmeric patterns of vocal layers busily entwine themselves around each other. It’s easy to lose oneself in the labyrinthine soundscape at the song’s climax. Whitton’s ability to tell stories through her songs is remarkable. This talent goes beyond her lyrics to include her choice of backing vocal styles, which differ from track to track and which help to form the character of the compositions themselves. She knows her stuff; nothing on this release is haphazard – every decision is important, every element has a purpose. Appearing at its end, “Fireflower” is Invirtue‘s most interesting track. The E.P.’s clever utilisation of the stereo spectrum shines most brightly on this song. Frenetic, shifting hard-pans left to right on the echoing vocal, an audio sample of white noise (the E.P.’s second non-vocal element) and a whole lot of processed vocal-ambience coalesce to create the most ghostly, ethereal moment on the release. It’s the aural equivalent of a Lynchian dream-state; a gorgeously unsettling way to finish an all-too-brief collection of songs. Invirtue was recorded, produced, engineered and mastered entirely by Whitton. Despite some slight over-compression on her vocals from time-to-time, resulting in a marginal loss of vocal dynamics, the E.P. is a stunning achievement. 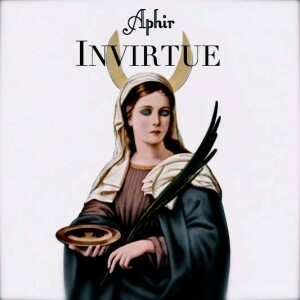 The tracks which comprise it are available on Aphir’s Bandcamp page, but it is worth tracking down a physical copy of Invirtue (some were available at a recent show). I won’t spoil the surprise, but the handmade nature of the packaging makes it an artefact to treasure. There is a lot of space in these tracks, yet they feel full, both aurally and spiritually. The pensive vocals and heavy lyrics they carry clearly possess a profound importance for Whitton. But, would an album’s worth of such weighty material be too much of a challenge for the casual listener? Having cultivated a sound like this, is she even aiming for Aphir to cater to such an audience? Or, is this a project undertaken purely for the sake of creating something personal, something beautiful from the many trials life throws at you? These are questions for Becki Whitton to ponder as she plans Aphir’s next move. This entry was posted in Music and tagged a capella, aphir, indie, music, pop, vocals. Bookmark the permalink.